Though I've spent a lot of time fooling around with the various speed versions of the iP3/T slot-to-socket adapter, PowerLeap has another product targeted at Tualatin processor upgrades. In this case, the adapter converts from Socket-370 to....Socket-370! Say what?? Well, it's really quite logical, because the adapter's purpose is to make Tualatin processors compatible with Socket 370 motherboards, like the Intel 810. So the point is to make the processor's pin-out configuration compatible, NOT to change the connection form factor. 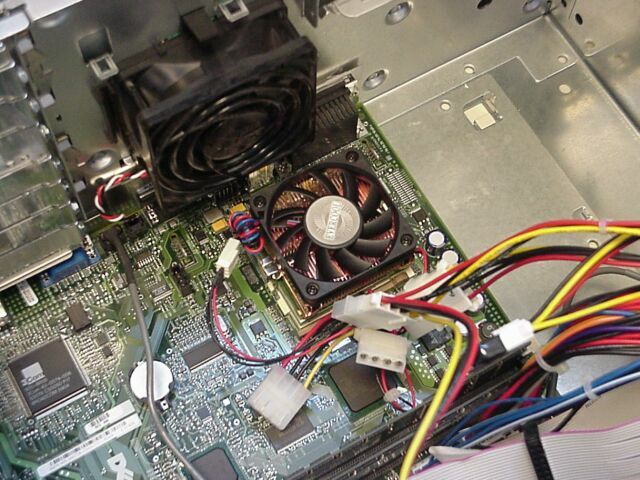 As it happens, where I work, the "standard" office PC is a Dell Optiplex GX110, fitted with a 133MHz FSB Socket-370 Coppermine P3 processor. Depending on the age of the machine, the processor speeds range from 667 to 933MHz. Browsing through PowerLeap's compatibility list for the 370/T adapter, I noticed that the GX110 was shown as "compatible". Since part of my job responsibilities includes running some VERY long and CPU-intensive Excel macros on a regular basis, I thought to myself, "Hmmm, it would be interesting to see what a nice, fast Tualatin P3 could do for me here!" Let's face it, nobody enjoys looking at that old Windows hourglass while their PC recalculates big spreadsheets ad nauseum. So, after exchanging a couple of e-mails and waiting a day or two, a package showed up on my desk, containing an evaluation sample (retail package) of the 370/T along with a 1.4GHz Tualatin P3-S. The "S" stands for "server", and connotes the use of bigger 512KB L2 cache on the processor. 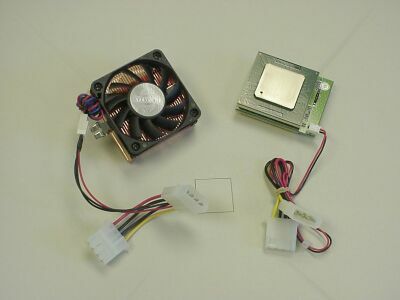 Unlike the iP3/T rig, this unit does not come fully assembled (see photo at right), because the Evercool heatsink/fan assembly has to attach directly to the processor socket on the mobo. However, the CPU is pre-inserted in the 370/T adapter. A small tube of Arctic Silver alumina-based thermal grease is included for use in the final installation of the adapter/CPU and HS/fan in the PC. So, with the blessing of our IT manager, I popped the lid on my GX110, removed the green plastic air-flow directing cowl over the processor, and took out the existing CPU and it's passive heatsink. Next, the 370/T was inserted and locked down in the now vacant socket, and I completed the installation by clipping the heatsink/fan onto the socket frame. It's a pretty tight fit, but with a bit of patient wiggling, it snapped into place. After attaching power leads to the adapter and fan plugs, I was ready to power up (photo at right). I hit the power button, and the system started to POST...and then quickly halted, displaying an error message to the effect that an incompatible processor had been detected. Huh?? A quick trip back to the PowerLeap website revealed the problem. Looking at the details on the GX110 compatibility, I found a statement that the upgrade must be done with the A05 BIOS version. Unfortunately, my machine was running A08! Apparently, Dell and/or Intel had decided to "lock out" the Tualatin processors on the later BIOS versions (boo, hiss!). And I was not about to attempt to convince our IT manager to let me "back-flash" to the earlier BIOS version, so it appeared that the Great Optiplex GX110 CPU Upgrade Experiment was at an end. Bummer! But hold on a second! A check with IT revealed that many of these GX110's had recently been upgraded to the A08 BIOS as part of an overall migration from NT 4.0 to Win2K. But there were still a few units around that hadn't been converted yet, and might have an older BIOS version. As it happened, right outside my office was a cubicle that had been unused since early in the year when an individual had resigned and the position hadn't been back-filled. Out of curiosity, I walked over and pushed the power button on the unused GX110 sitting on the desk. As the system began to POST, the BIOS version flashed on the screen....A05! HOT DAMN!! BACK IN BUSINESS!! Again, with the patient forebearance of the IT manager, I swapped hard drives between the two machines, and installed the 370/T in the unused PC. When I powered up, the machine booted up absolutely normally--no "incompatible processor" messages this time. I was up and running at 1.4GHz. Great! Now, what'll she do?? The first thing I needed to do was decide how I would benchmark the performance of the 1.4GHz Tualatin P3-S versus the Coppermine P3-733MHz previously in the machine. Keep in mind that this is a "corporate PC", designed for stuff like Lotus Notes, Excel, Word, and other such applications (see system specs at right). The video subsystem on this GX110 can charitably be called ANEMIC, utilizing the dreaded "integrated Intel 3D AGP graphics". So, needless to say, 3DMark2001 and Quake 3 Arena were pretty much out of the question! I decided to use two lengthy Excel macros of the type I mentioned earlier, along with Mad Onion's PCMark2002 general PC benchmark test. The Excel macros took on the order of 8 to 10 minutes to run on the original processor, and CPU usage was at 100% for virtually the entire time. So these seemed like a pretty good workout for a processor--plus they represented exactly the type of application I was looking to speed up.